A new kitchen or kitchen remodel can instantly add value to any home. Decades ago, the family room was often viewed as a home’s central gathering place. But things have changed and the new layouts you see these days seem to reflect that. The kitchen has become the focal point of many modern-day residences — with open-concept layouts that flow into other spaces like the dining area and living room. Kitchens are places where the whole family can gather for breakfast before heading out to work and school. It’s a place where kids can do their homework while mom and dad prep dinner. Or where your guests can mingle over drinks before you shuffle them out to the deck for a BBQ. Given all the activity that happens in kitchens every day, it’s no wonder people spend so much time and effort designing the perfect space. 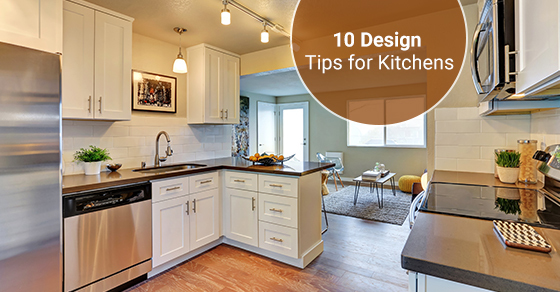 We’ve laid out 10 tips to help you come up with the kitchen of your dreams. Whether your style is rustic farmhouse or Scandinavian minimalist, you’ll certainly find inspiration in these suggestions from the experts. Yes, the kitchen is essentially a working space. It’s a place to prepare breakfast, pack lunches, and cook dinners for the family. But there is also a lifestyle component that cannot be ignored. Kitchens have become spaces where parents and children can bond after a long day. The breakfast nook is a place to share laughs in the morning before everyone separates for the next eight hours. Your kitchen layout should reflect how the space will be used, and where family members will be situated as they interact with one another. How much counter space do you need for cooking? Would you like to incorporate an island and stools so your kids can hang out while you make them snacks? Do you want your dining room to be fully visible from the kitchen so you can interact with dinner guests as they sit down to eat? These are questions you should ponder while designing your layout. The last thing you want is a space that’s awkward and not in line with the way in which you want to actually use your kitchen. The quality of your sinks and taps can make or break your kitchen remodel. These things are just as important as the appliances, so don’t skimp on the cost. Choose stainless steel sinks that have a higher percentage of nickel and chromium as this means the steel is strong and durable. If you’re looking for more counter space, it may not be a good idea to install a double-sink. On the other hand, if you have more space to work with, consider putting in a double-sink and then a small single sink in your kitchen island. Having two sink areas is a luxurious feature that allows two people to prep food at the same time. In terms of tap finishes, it’s best to consider how they’ll look with the whole kitchen as opposed to just the sink area. Whichever tap handles you end up choosing, don’t forget to consider the handles and how they’ll enhance the overall look. Some homeowners really like the look of marble and will put up with the extra maintenance to use it for their countertops. But if you’re looking for a material that’s durable and easy to clean, consider engineered stone instead. Often referred to in the industry as quartz, this material is made from quartz crystals held together with a resin binder. While natural stones like marble and granite are porous, quartz countertops will not absorb liquids. This means you won’t find bacteria trapped inside, which is a huge asset to food safety. Another benefit is that the color is more uniform than natural stone. You may think that pot lights are the only way to light up your kitchen. But to create ambiance, you must use task and decorative lighting together. Task lighting includes valance lighting and LED bulbs under the cabinets to make your workspace more user-friendly. Decorative lighting includes things like pendant lights and chandeliers. For many homeowners, backsplashes are an afterthought, often picked out at the very end stages of a kitchen renovation. But the truth is, backsplashes are a visual focal point and thus carry a lot of weight. An oversized slab of marble will bring luxuriousness to the overall aesthetic, whereas bold tiles in bright colors can bring a sense of drama. Choose your backsplash in the early stages of your project and the rest of the decor will fall in line accordingly. You should never skimp on hinges and runners as these are the true workhorses of any kitchen. When it comes to cabinetry, German-engineered hardware is the way to go. Brands like Blum and Hafele will cost a little more, but your investment will be well worth it in the long-run. If you live in an apartment or condo, you may not have much flexibility in terms of moving the plumbing or electrical systems because the structure of the building may not allow for major changes. On the other hand, a house reno has many more options as to where the kitchen sink and dishwasher can go or where the chandelier can be hung. Always hire a professional plumber or electrician to help with these areas. If you don’t have a lot of square footage to work with, consider the symmetry of your cabinetry. Cabinets that are well-proportioned can make a small kitchen feel much bigger. Although you may like the look of tall cupboards, drawers work better in small areas as they offer 30 percent more storage space. If you have lots of room to work with, consider incorporating a butler’s pantry. This utility space is good for prepping vegetables, washing small dishes and cleaning up. You can then free up the rest of your kitchen for things like a breakfast bar, an eating nook or any other type of social area. This configuration is ideal for homeowners who love to entertain and enjoy being with their guests as they prep for the party. The last thing you want is a marvelous kitchen that’s a pain to take care of. When choosing your materials, pick durable finishes that won’t chip and are easy to clean. Countertops made of marble or granite are luxurious but will require special maintenance. That’s because natural stone is porous and stains easily — not to mention all the scratches you’ll have to endure as well. And when it comes to hardware, choose high-quality hinges that will last you a lifetime. Good maintenance is key to a beautiful kitchen space, so don’t make things harder on yourself by choosing impractical materials. For more information or for help with your kitchen remodelling, call Avonlea Renovations +1 (416) 422-5276 or contact us here.